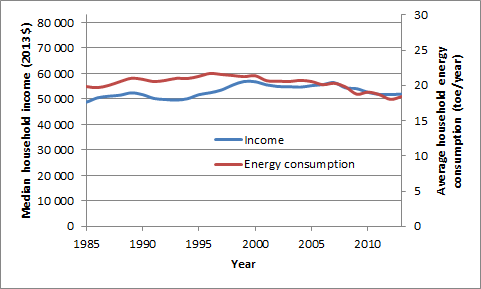 A lot has been written recently about the decoupling between GDP and energy. This decoupling (shown for the IEA New Policies scenario below) is generally viewed as a central part of the solution to the the sustainability problems we face in the 21st century. 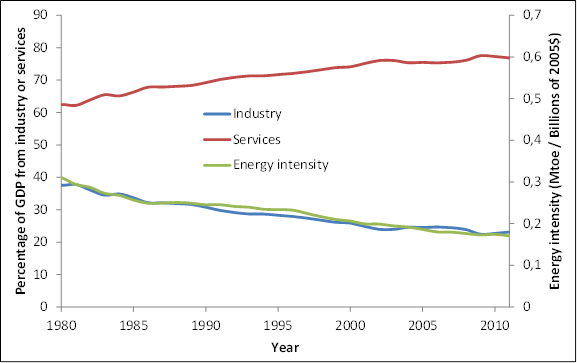 Decoupling between economic growth and energy consumption is often attributed to energy efficiency, but in actual fact stems primarily from the general transition to more service-based value creation as economies mature. As an example, the graph below plots energy intensity in the US against the fraction of the economy dedicated to manufacturing (the balance being services), revealing a almost perfect correlation. 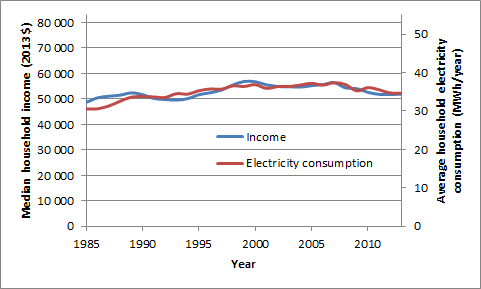 These trends pose some serious questions regarding the notion that rich nations can continue to increase standard of living without increasing energy consumption (and the associated environmental impact). 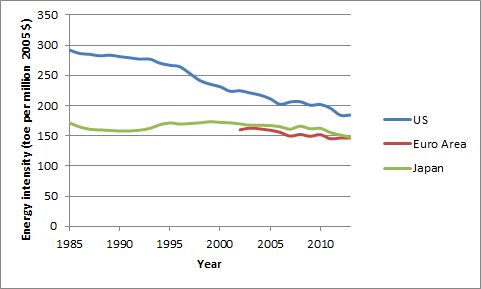 If it is really this difficult to achieve decoupling in nations enjoying decent standards of living, the world will need to quadruple energy consumption in order to bring the global population to current developed world standards. This will not be possible without some real technological miracles. One would therefore very much like to believe that Europe and Japan will one day manage to achieve a meaningful economic recovery and that the recent divergence between household income and domestic production in the US will reverse. 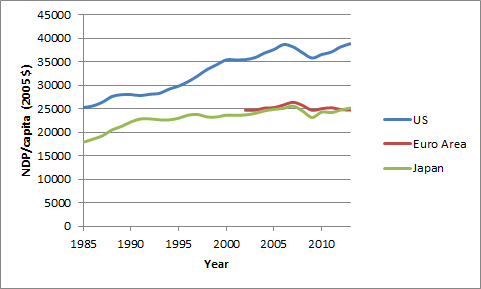 However, Japan has recently completed its second “lost decade” while Europe followed suit with its first. In addition, one can argue that a rising investment/consumption ratio coupled with increasing inequality is an important part of the reason why US GDP could continue expanding while Europe and Japan stagnated.